Q: I love to enjoy DVDs on weekend, so I have a lot of DVDs at home. Recently, I wanna convert these DVDs to my iPhone 6S, and iPad for playback on journey and share them with my friends. Is there any suggestions on DVD to iPhone, iPad Converter? A: As you know, DVD disc and folder are in the formats that are not well-supported by Apple devices: iPhone, iPad. To put DVD movies to iPhone, iPad, you can try to rip DVD to iPhone 4S, iPhone 5S, iPhone 6 supported video formats or the latest iPhone 6S . 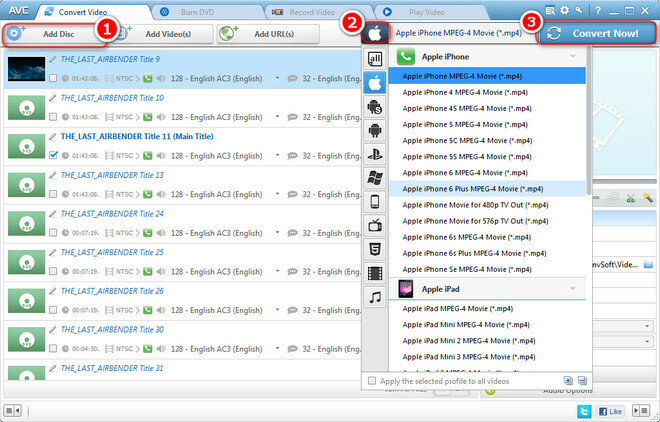 A best DVD to iPhone, iPad Ripper will be recommended for you – Any Video Converter Ultimate.Both of Windows Version and Mac Version for this iPhone, iPad DVD Ripper are all available, we will take the Windows version as an example in this guide. Put the DVD disc to your computer DVD driver. Click Add Disc button, then a dialog will pop up, just press OK button, all DVD files will be loaded from your DVD to the DVD iPhone, iPad Ripper. Step 2. Select output video format from the drop-down list. Click "Apple" icon from the profile, a drop-down list will unfold, just select the format you need to convert for your iPhone, iPad. Step 3. Start ripping DVD movies to iPhone, iPad. Now, click Convert Now button on the upper right corner of the program to start converting DVDs for iPhone, iPad. Once conversion finished, you can transfer these converted DVD movies to your iPhone, iPad. Video Format AVI, FLV, MPG, MP4, M4V(without DRM), M2V, SWF, 3GP, 3G2, 3GPP, MOV, TS, TP, TRP, M2TS, MTS, MKV, DV, WMV, MOD, TOD, ASF, DAT, F4V, VOB, RM, RMVB, DivX, XviD, MXF, H.261, H.263, H.264, NUT, NC, NSV and more. 100% Secure. No Adware nor Malware.